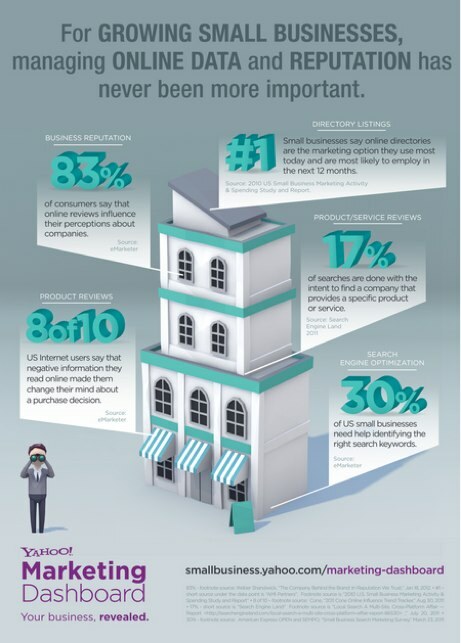 You may not know this but Yahoo still operates a product called Yahoo Small Business, which provides SMBs and sites with web hosting, domain name registration, web site design templates, e-commerce solutions and more. In fact, Yahoo says that it has helped millions of businesses get online and grow their presence on the web. Today, the company is debuting a new marketing dashboard to give users additional insight into online reputation, web metrics and more. As the company explains, the new tool allows small businesses to analyze website metrics and maintain accurate and comprehensive business listings across the Web. For example, the dashboard enables social media monitoring and provides recommendations on new listing opportunities, including on Yelp, Yahoo and others. The dashboard also includes online reputation management, pulling information and reviews from up to 8,000 sources such as Facebook and Twitter. Users can access website performance metrics from various sources including Google Analytics. And the dashboard provides email marketing, SEO, and SEM campaign tracking. The marketing dashboard also has a number of paid features, including a suped up version of its reputation management functionality, email campaign tracking, and more. It should be interesting to see if Yahoo Small Business will survive new CEO Scott Thompson’s plans to cut 50 Yahoo properties.